Don't you love pirates? 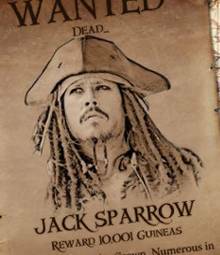 Would it shock you to know that not all pirates are as nice as Captain Jack Sparrow? Well it's true. These pirates are called rogues in the book The Pirates of the Caribbean: The Price of Freedom by A.C. Crispin. They don't even follow the Pirate Code. (Shocker, I know) They just roam the seas with their big old guns and scare ships into putting up a white flag. But instead of taking the cargo and leaving they kill the whole crew and run away. This is not good for awesome pirates because this get's the government mad. Mad enough to start a war. So Captain Teague, keeper of the code, decides to track down these rogues. The brethren court decides to summon Davy Jones in order to find the culprit. When Davy Jones arrives he says that the leader of the rogues is non other than Boris or Borya Palachnik, Pirate lord of the Caspian sea and captain of the Koldunya. Teague quickly arrests him. Borya quickily gives up his rogue friend, Christophe. This is when Jack comes in. See Christophe was Jack's closest freind at the time. Christophe tells Teague that his final wish, before getting hanged is to talk with Jack. Teague agrees to his terms but insists that a gaurd watches them at all times. Jack comes in and Christophe immediately convinces him that he's innocent. Christophe: “Jacques, tomorrow at dawn they are going to hang me, and all my men, who are innocent, too. We are pirates, yes, but you are a pirate, too! We have not broken the Code! It is Captain Borya's malice, his final revenge on an enemy that has brought us to this pass. Jacques, you are my best friend in all the world...please. Help me.” Jack makes one of his rare mistakes and believes him. Jack secretly frees Christophe and his crew who promptly knocks him out and brings him on board his ship. Jack becomes a "honest sailor" after that and joins the E.I.T.C. because he fears hat if he goes back to shipwreck cove he'll be hanged for freeing a prisoner. He realizes that the only way to redeem himself would be to Kill Borya and Christophe. But he finds this to challenging and continues as captain of the Wicked Wench. However on a voyage to the lost city of Zerzura he runs into Borya, still sailing under the rogue flag, a demon on a red clothe. Jack knows the waters that they are sailing and leads borya into a trap. 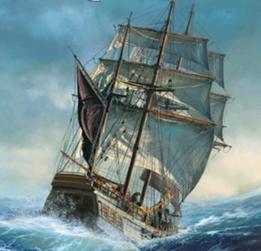 Jack would sail through some shallow reefs, avoiding running aground, until Borya who didn't know the area would. This plan goes sucessfully. . .until Jack's ship runs aground as well. So both Ships are unable to move and so both ships continue to fire at each other until Ayisha, the magic princes of Zerzura who was onboard, lights the Koldunya's magazine on fire, blowing up the whole ship. Later when Jack uses his compass to find Christophe who is in possesion of the third bracelet needed to open the door to Kerma's treasure Jack ditches christophe without giving him his share. Christophe orders his crew to go and get JAck but they think he's going crazy and leave him on a row boat in the middle of the ocean. He finds Jack's ship and boards it. He challenges Jack to a duel and he accepts. They run around the whole ship and in the end Jack wins. And So our hero is is free to pirate another day.